Our Team are happy to provide bespoke solutions to those who wish to install a set of automatic revolving doors on their premises. We are fully aware that the needs of no two clients are ever alike, so our services will truly mould around your own requirements. Boasting quick turnaround times and a host of different options, there is no task too large or too small that we are unable to address. WHAT ARE THE BENEFITS OF REVOLVING DOORS? 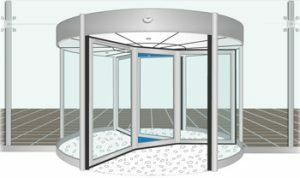 Automatic revolving doors are able to solve several unique foot traffic issues. First, they provide an efficient means for the public to enter and exit a specific location. These doors are also able to somewhat restrict the flow of traffic; ideal for locations which are known for a large number of visitors from time to time. They can also be customised to suit access control needs. Besides these rather functional attributes, the fact of the matter is that modern rotating doors are some of the most aesthetic entrances currently available on the market. They can be fashioned completely from glass or aluminium frames may be added; ideal for matching the design features of an existing environment. Automated rotating doors are an ideal solution for a wide range of commercial buildings and properties including hotels, retail outlets, airports and much more. The purpose of the original revolving door has been transformed from a simple yet functional, pedestrian flow management solution, to a fully customisable entry solution that has the ability to adapt year on year with the latest security and design trends. By working closely with clients and architects, we’ve been able to continuously innovate our revolving door products so that they really do fit the needs of the buyer no matter the requirements. Proudly holding the title of the market leaders in revolving doors, you can expect a fully accredited product, tailored to your specific industry needs. Whether it be automatic revolving, manual swing or power assisted, our specification advisers will ensure nothing but operational excellence from installation, maintenance to future upgrades or retrofits. 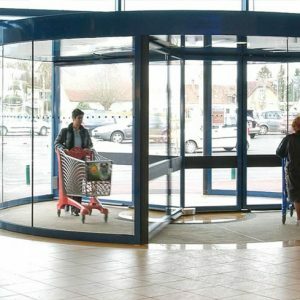 Automatic revolving doors are perfect for malls and stores as the doors are designed to handle large and continuous foot traffic. Many hotels, shopping centers, and office blocks are now using automatic revolving doors.